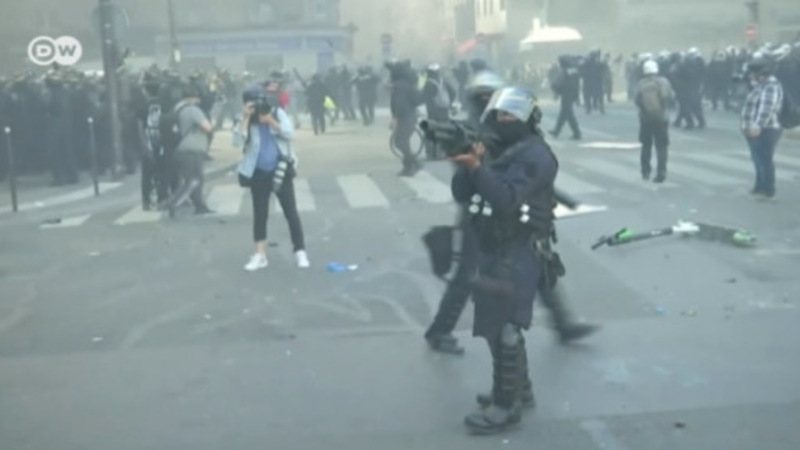 The French Senate has passed a law that increases the circumstances in which police may legally open fire. Police are now allowed to open fire on fleeing suspects, detainees and vehicles if they pose a deadly threat. The Senate approved a law on Thursday that brings the powers of French police in line with those of its paramilitary gendarmerie. While in the line of duty, police may now shoot at fleeing suspects or detainees who pose a threat to authorities' lives after giving two warnings. Police may also now open fire on vehicles that ignore orders to stop and that also pose a deadly threat. Additionally, they can shoot to stop rampage killings. The Senate's vote comes amidst renewed tensions in the outskirts of Paris after a local black man was allegedly raped by policemen with a baton during a check in Aulnay-sous-Bois two weeks ago. The French capital's northern suburbs have seen rioting for days since news of the incident broke, with dozens of arrests. The victim, known only as Theo, was released from hospital on Thursday, local media reported. Thursday's change comes four months after a firebomb attack in another Paris suburb seriously injured two officers and caused outrage in the police force. The Senate-approved law also re-enacts a ban on repeatedly viewing extremist websites that show killings - one week after the measure was struck down by the Constitutional Council. Attempting to work around the council's objections, the latest provision only makes viewing such sites a crime if the user also expresses support for the ideology of the site hosting the videos. The militant "Islamic State" group, which claimed responsibility for deadly terror attacks in Paris in 2015 and Nice in 2016, have used the internet to spread propaganda. French gendarmes take up positions in nothern Parisian suburb, Aulnay-sous-Bois, in an attempt to minimize violent clashes. Protesters display signs reading "Justice for Theo" on Monday before violence broke out later that night. French police officers stand by the entrance of the Menilmontant metro station as protests continue into Monday evening. An unidentified man demontrates his support in front of French police for a young black man who was allegedly assaulted by officers while in custody. A French police officer guards an entry point to the Menilmontant metro station as protests continue into Monday night. A woman raises an accusatory sign during Monday night's protests against police violence. A member of French activist group 'Nuit Debout' (Up all night) known only as Rico speaks to protesters on Monday night after accusations of police violence. The social movement began in March 2016 and has been compared to the Occupy movement in the United States. A woman holds a sign reading "Justice Pour Théo" (Justice for Théo) during Monday night's protests in Paris. French President Francois Hollande (R) meets with youth worker Théo as he recovers from major surgery after his arrest by police. Hollande has continued to call for calm following the incident. Daybreak reveals the remains of a car torched by protesters on Monday night in the northern suburb of Aulnay-sous-Bois.